Donovan McNabb likes the Phillies, especially his bud Jimmy Rollins, the shortstop big on predictions. McNabb stayed up late to watch the Phils 3-1 loss Thursday night to the New York Yankees evening the World Series at one game apiece. Oh, and he thinks Phils manager Charlie Manuel did the right thing taking out starter Pedro Martinez in the seventh inning. 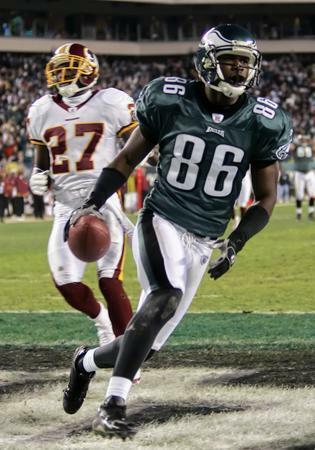 McNabb (pictured in the grasp of Hollis Thomas) almost didn't have to be prodded to offer his prediction. "Phillies in six," he said. "There will be a parade. The Yankees are going to have problems with their pitching. Look for (Ryan) Howard to hit a home run. Look for Jayson Werth and (Raul) Ibanez to homer. Look for Howard to hit his to right field and the other guys left field. I just have a feeling about it." Rollins predicted Phils in five, and possibly six. Donovan McNabb didn't make excuses for his second straight substandard game. 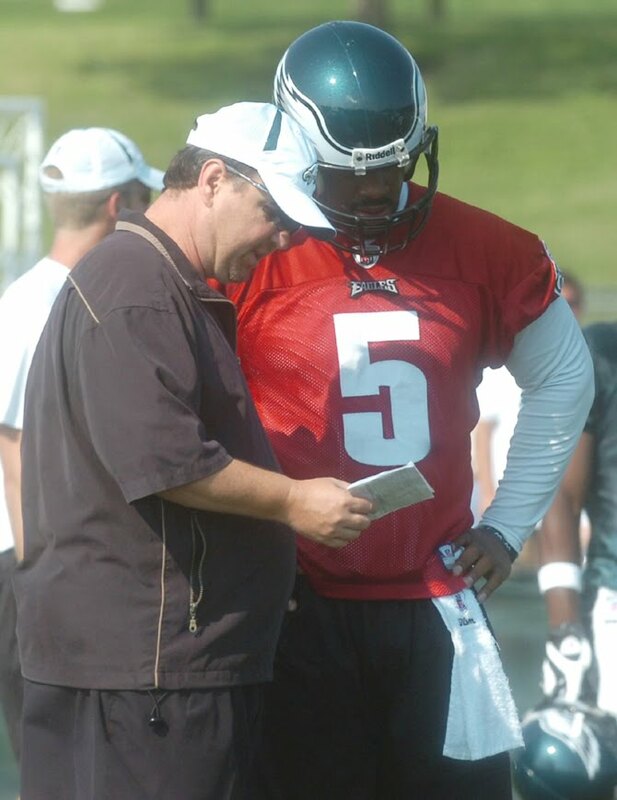 But in so many words, Eagles offensive coordinator Marty Mornhinweg (pictured with McNabb) did just that Thursday. Mornhinweg said McNabb "played very smart" in the second half of the 27-17 win over the Redskins, even if it wasn't reflected in the stats. 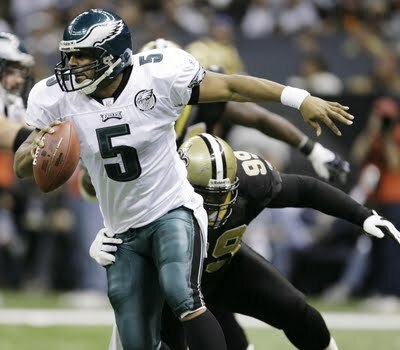 McNabb completed just five of his last 11 passes for 38 yards after connecting with DeSean Jackson for a 57-yard touchdown. "Three or four of those were throwaways," Mornhinweg said. "The only way (the Redskins) were going to win was if we made mistakes. They needed two or three of them. Donovan played very, very smart." The roster spot to open when linebacker Omar Gaither goes on injured reserve after foot surgery could go to an offensive lineman. 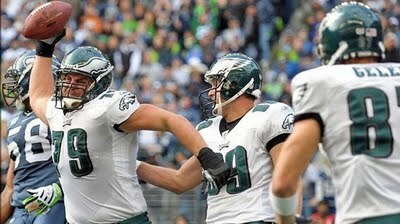 But it won't be veteran Jon Runyan, who played for the Eagles from 2000-2008. The Eagles are happy with right tackle Winston Justice, and encouraged enough with the progress of King Dunlap to respectfully pass on Runyan, who is on the mend from knee surgery. It's a shame because the O-line could use a little more stability, what with Shawn Andrews in and out of the big picture so often and injuries hitting both sides of center Jamaal Jackson. And the Birds never can have enough leadership, which is what Runyan supplied almost every minute he was on the team payroll. Eagles veteran wide receiver Kevin Curtis underwent a surgical procedure on his ailing left knee Saturday - more than one month after he suspected it would need repairs. At the Eagles' urging the 31-year-old Curtis tried to practice through the pain and swelling that surfaced the work week after the regular season opener. 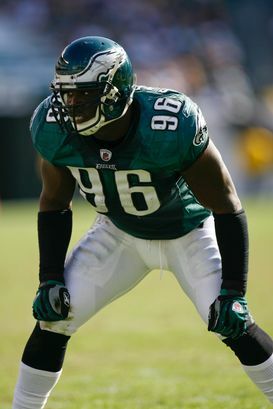 After Curtis (pictured) finally got the Eagles to sign off on a second opinion, voila - surgery. He hasn't played since the second game. 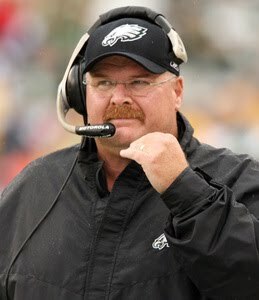 Andy Reid blamed the delay for the surgical option on inconclusive MRI's. Reid still is hopeful Curtis - the team's only reliable route runner with game-breaking speed - can return this season. "I think time will tell here but I think so,” Reid said. The Eagles also reported that middle linebacker Omar Gaither had surgery Saturday for a Lisfranc sprain of the left foot. The good news is Gaither had just one pin, not two inserted to correct the gap in the bones of his foot. Gaither, however, still is likely to go on Injured Reserve, meaning his season would be over. Eagles middle linebacker Omar Gaither, as reported here, has a Lisfranc sprain in his right foot that Andy Reid said will “most likely” end his season. Reid said Wednesday that newly acquired linebacker Will Witherspoon would start in the middle when the Eagles oppose the Washington Redskins Monday night at FedEx Field. Witherspoon, obtained from the Rams for rookie receiver Brandon Gibson and a fifth-round pick, also will play a little weak side linebacker. Veteran Jeremiah Trotter and possibly Joe Mays could get snaps in the middle, as well, according to Reid. Gaither injured the foot late in the 13-9 loss to the Oakland Raiders this past Sunday. He exited the locker room in considerable pain. 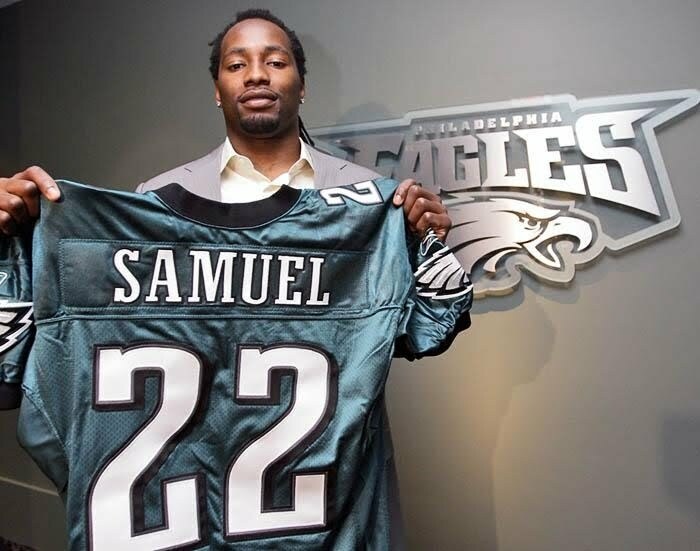 This could be the end of his career with the Eagles as his contract expires after this season. Also on the injury front, wide receiver Kevin Curtis, as reported here, will have another doctor evaluate the knee that’s been swelling up on him the past month. Curtis has been frustrated trying to work through the pain. Defensive end Victor (knee sprain) and cornerback Dimitri Patterson (strained quadriceps) likely are out this week according Reid. The good news is left offensive tackle Jason Peters (knee, ankle) was at the walkthrough Thursday morning and is slated to practice, as is guard Todd Herremans, who has missed all five games with a stress fracture in his left foot. Reid said Herremans would work at both guard and tackle. The Big Guy expects a gut check as the Eagles (3-2) face the roughest stretch of their schedule to date. After the Redskins (2-3), who look every bit as desperate as the Raiders, the Birds take on the NFC East-leading Giants (5-1). LOT Jason Peters was helped off the field with a strained left knee in the first quarter, his replacement King Dunlap. The Eagles said X-rays were negative. DT Brodrick Bunkley may have cracked a rib in the second quarter. The Eagles would not confirm if he'd been X-rayed. Luckily they activated five defensive tackles. The Eagles had a pretty good reason to scratch wide receiver Kevin Curtis for the third straight game. Curtis is on the trade block according to reports. With more than enough wide receivers to get the job done against almost any team, much less the clumsy Oakland Raiders, it made no sense to subject what could be a valuable commodity to injury. 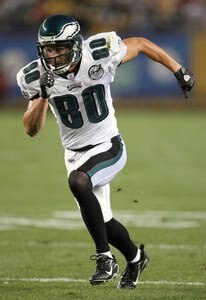 Curtis probably wouldn't bring the Eagles a first-day despite the league-wide demand for fast, veteran wide receivers. But it helped that he practiced all of last week. The Baltimore Ravens are looking for help on the outside. They're coached by John Harbaugh, who previously worked for the Eagles. Also, the Eagles made Michael Vick the backup quarterback implicitly by designating Kevin Kolb the third quarterback. The Eagles kept three quarterbacks active the past two games. If the third quarterback plays, the other two canot return to the game. All of the Eagles billed by the NFL for excessively rough play plan to appeal. Not that anything good is going to come of it, as one player said. If you look at the hits that got the players fined it's like going back in history. For one afternoon the Eagles played like those warriors archived on NFL Films. Those were the days tacklers got away with putting their man on the ground long after he'd gone out of bounds or the whistle had blown. The days when the facemask was part of the player. And the face of a quarterback was fair game just as it is with the other players. Victor Abiamiri: $5,000 for roughing the passer (struck opposing quarterback in head area). Omar Gaither: $5,000 for unnecessary roughness (unnecessarily struck opponent late and out of bounds). Asante Samuel: $5,000 for unnecessary roughness (grabbed opponent by facemask in attempt to tackle him). Left guard Todd Herremans, out nine weeks with a stress fracture, thinks he can be back in the lineup when the Eagles play the Redskins in two weeks at FedEx Field. But the veteran really doesn't want to be start of a rotation at the position he's ruled the past three seasons. Nick Cole has played left guard and Max Jean-Gilles and Stacy Andrews have manned right guard. "I would hope not," Herremans said. "I don’t think I’d really like to play in a rotation. But it’s not my decision. I would prefer not to." Herremans (pictured in spike form) said that while the foot feels fine he's had an issue with the accompanying ankle. "It feels a little tired," he said. Eagles veteran guard Todd Herremans got on the field in pads Wednesday for the first time since training camp. It was supposed to be a 15-minute session. It ended after 10 minutes. Herremans wants to return for the Monday night game Oct. 26 at Washington. "This is the first step here," Andy Reid said. "I don't know how it's going to turn out." Herremans and nickel cornerback Dimitri Patterson (wrist, groin) won't play against the Raiders. Winning cures everything, with one exception - flatulence. To give you an idea of how loose the Eagles are, Michael Vick was in front of his locker Wednesday telling the media there would have been a quarterback controversy had he wound up in Oakland when a teammate passed by - and passed something else. The noise was so loud Vick began laughing. "We've got to find the culprit," Vick said. It was Reggie Brown (pictured in a more stable moment). Walking the hall moments later with a grin on his face, Brown was asked if he felt OK.
"Man," he said. "I don't know." Hey, life is good for the Eagles, who are off to their third 3-1 start with Andy Reid. The Eagles are favored by 14 points against the Oakland Raiders (1-4), whom they oppose Sunday at Oakland-Alameda County Coliseum. Wide receiver Kevin Curtis (knee) was deactivated along with defensive tackle Trevor Laws, among other players as the Eagles again kept all three quarterbacks active. The way rookie wide receiver Jeremy Maclin played, catching touchdown passes of 51 and 40 yards in the first half, you can safely assume Curtis won't be rushed back on the field. Omar Gaither isn't the only starter to lose his job over the bye week. Rookie Jeremy Maclin is the guy at wide receiver, not veteran Kevin Curtis. It's the second straight year a veteran has lost his starting job to a rookie basically because of an injury. Call it the Reggie Brown treatment. Enamored with second-round pick DeSean Jackson last year, the Eagles quickly fell out of love with Brown, who was managing groin and hamstring injuries. First-round pick Maclin has remained the starting wide receiver although Curtis is practicing this week. "Jeremy did a good job the last game," offensive coordinator Marty Mornhinweg said. "He played well so we'll keep him going and try to get Kevin healthy as quick as we can. And Kevin is doing better. That thing is feeling a little bit better." Maclin is confident he can keep the job. "I'm happy to be in this situation now," he said. "I've got to continue to make the best out of this opportunity." For the third time in three years the Eagles have taken Omar Gaither's starting job. Jeremiah Trotter likely will be the middle linebacker on first and second downs, Gaither (pictured) the man in passing situations. "Do I think I could have done the job? Yes," Gaither said. "But they brought him in and there's nothing I can do about that now. Obviously there's a lot of things that happened to me here that I have no control over. But I just keep rolling with the punches." Andy Reid isn't sure how much football Trotter has left after basically two years away from football. And he talked about spotting Trotter to make maximum use of his size and skills sets. At this point the Eagles want Trotter - who weighs 20 pounds more than Gaither - to penetrate the backfield and take on blockers including fullbacks. Something to keep in mind when Andy Reid takes on the Buccaneers this weekend - and for all practical purposes the Raiders in two weeks. Reid is 17-6 (.739) against rookie head coaches. That includes an almost flawless 11-2 (.846) mark in South Philly which is where rookie coach Raheem Morris brings his Bucs this weekend. The last rookie schooled by Reid (pictured) was Todd Haley, whose Chiefs suffered a 34-14 defeat at the Linc which was much worse than the math. Obviously a lot of rookie head coaches step into rebuilding situations. Basically that means a lot of bad teams.The Bucs and the Chiefs are a combined 0-8. That said, Reid enjoys beating them up and then praising them for the privilege of allowing him to do so. Next week the Eagles could find themselves taking on an interim head coach because Raiders coach Tom Cable could be suspended for reportedly slugging an assistant. The Raiders are 1-3.